The Pennsylvania Student Assistance Program (SAP) is a systematic team process used to mobilize school resources to remove barriers to learning. SAP is designed to assist in identifying various issues, including mental health issues which pose a barrier to a student's success. The primary goal of the Student Assistance Program is to help students overcome these barriers so that they may achieve, advance, and remain in school. While Student Assistance Programs exist in other areas of the country, the structore and operation of the program in Pennsylvania is a unique expressionof an integrated model serving the needs of Pennsylvania families and students. The core of the Student Assistance Program is a professionally trained team, including school staff and liaisons from community drug and alcohol and mental health agencies. SAP team members are trained to identify issues, determining whether or not the presenting issue lies within the responsibility of the school, and to make recommendations to assist the student so they may access services within the community. SAP team members do not diagnosis, treat or refer to treatment; but they may refer a student to a liaison who may screen or assess for further community based services and support. 1.) 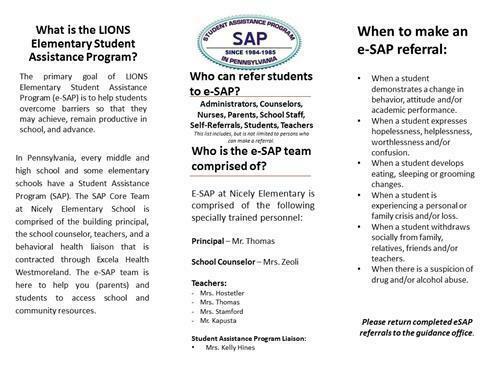 Referral - Anyone can refer a student to SAP when they are concerned about someone's behavior. A member of the SAP team then contacts the parent for permission to proceed with the SAP process. 2.) Team Planning - The SAP team gathers objective information about the student's performance in school from all school personnel who have contact with the student. Information is also collected from the parent. Together, a plan is developed that includes strategies for removing the learning barriers and promoting the student's academic and personal success to include in-school and/or community-based services and activities. 3.) Intervention & Recommendations - The plan is put into action. The team assists in linking the student to in-school and/or community-based services and activities. 4.) 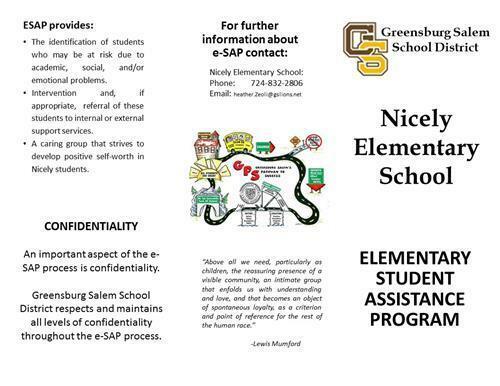 Support & Follow-Up - The SAP team continues to work with and support the student and their family. Follow-Up includes monitoring, mentoring, and motivating for academic success.